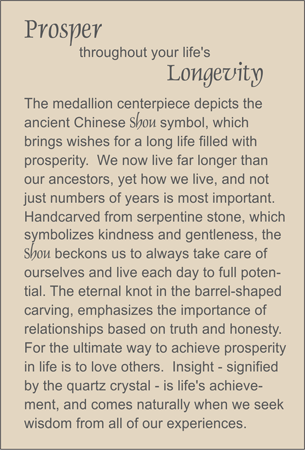 MEDALLION: Marbleized serpentine hand carved medallion depicting the ancient Chinese Shou which stands for long life and prosperity. LOOP: Rock quartz crystal and new jade. ACCENTS: Taupe-colored serpentine carved with the eternal knot that weaves seamlessly (bottom) and in the shape of an ancient Chinese coin (boat-like), and rock quartz crystal ellipses. COMMENTS: Only a handful of these Collector's Edition pieces remain.